Is the new Altendorf worth it? In 2016, after owning an Altendorf F92T panel saw since 2001, I decided it was time for an upgrade. Not that there was anything wrong with my old saw, but rather that my work making bespoke furniture had reached a stage where I was finding the manual adjustments on the F92T were just taking up too much time. I needed a CNC fence, the ability to store programmed settings and 0.01mm adjustability for fine tuning cuts. 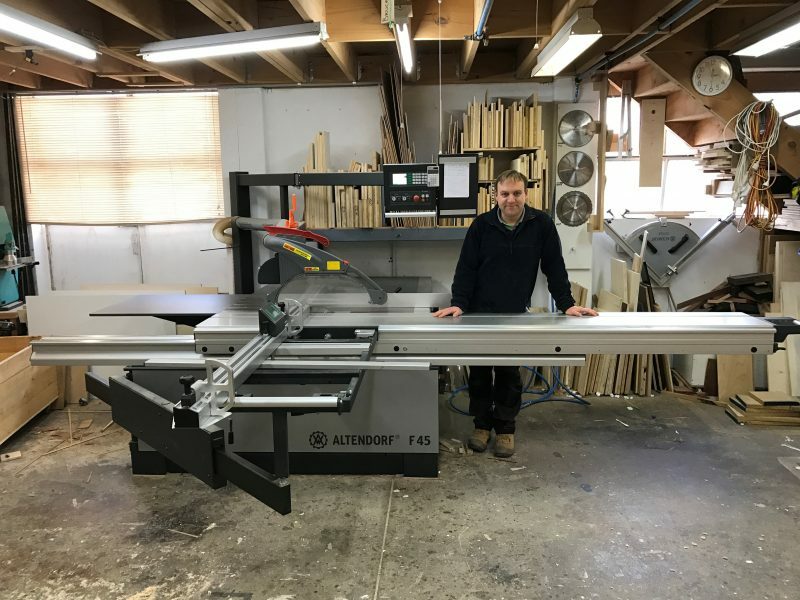 I visited AWISA in Melbourne and had a look at various saws on the market, but the build quality of the Altendorf stood out and I was already used to their back up service and reliability. I decided to purchase an F 45 Pro L – a model that has a CNC rip fence, tilt and blade height and manual digital read out on the crosscut fence. As I work in a small workshop I ordered one with a shorter than normal 3.2m table. In the almost one year that I have had my machine, the accuracy has been very reliable and the saw still cuts square from the first day it was set. I haven’t adjusted it once. Day in and day out I have found my F45 to perform as expected and more. I knew this saw would save me time, but I actually underestimated how much time would be saved by not having to manually move and set the rip fence like I used to on the F92T. The control panel is positioned at a comfortable height and it operates the rip fence, blade height, tilt angle and scoring unit adjustments. In my work I do a lot of rebates and slots, so I now have standard programs set for these for rip fence position and blade height. This function also saves me time; however, the real benefit is the repeatability. I can use a set program, then change to cut another panel to size, do something else and then go back to the program and the settings are identical. This is even more of a time saver when several people are using the saw. I joint a lot of solid timber table tops on my saw and have found the Altendorf sliding table does this very accurately and with ease. I have found the 5.5 kW motor to have more than enough power for all tasks and the joints achieved off the sliding table are invisible and far better than what can be achieved with a jointer. The cut surface is also makes an excellent gluing surface. Although the F45 can take up to a 450mm blade, I normally use a 300 or 350mm blade for my work, mainly out of habit. The F45 comes with a Rapido scoring unit, which is very easy to adjust and set up in a matter of minutes. The Rapido adjusts the width of the scoring kerf with a hex key, rather than with shims. I like the interchangeable dust hoods that come standard, with the wider one for tilting the blade up to 45°. These work well, from both a safety and dust collection point of view. One other small feature I like about the F45 is the choice of paint colour. I really like the gray and black combination and think it’s a nice change from the usual woodworking machine green. Calibration for blade height and kerf width when changing blades is very easy via the control panel. A few test cuts and some accurate measuring is all it takes. The battery powered Digit-L readout on the crosscut fence has been both accurate and reliable. The Digit-L comes with 2 rechargeable batteries and have found battery life to be around 3 months per charge. Instruction books don’t often get mentioned in reviews, but I think the Altendorf one is worth mentioning. 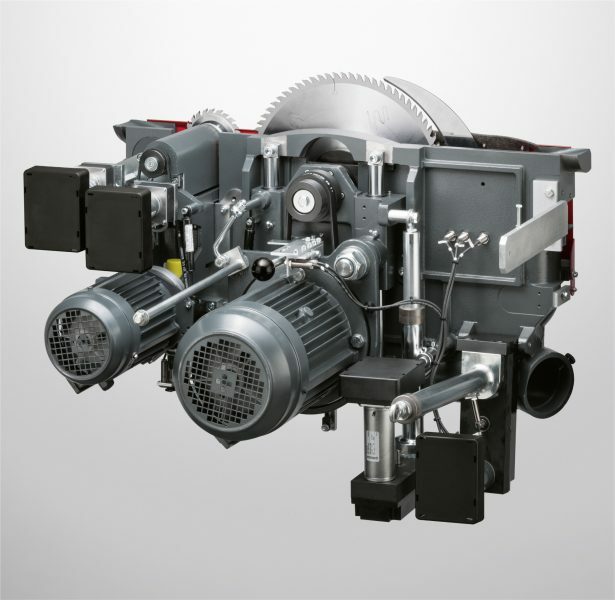 The instruction book that comes with the machine is both comprehensive and easy to follow. Good diagrams and photos make it easy to understand and I have referred to it several times so far. There is only one thing I can criticise and that I’m not happy with on the whole saw. It’s the dust extraction. I have a serious dust extractor and still find the dust extraction on this saw isn’t great. My previous Altendorf made the same amount of dust and its extraction was way better. My theory is the extraction hose port is too far from the blade and there is too much space in the dust hood that surrounds the blade. I’ve made a slight modification to mine, by adding a bent plywood ramp that curves around the blade and directs the dust down to the extraction hose. This I have found has greatly improves things. I believe the Altendorf F45 offers very good value for money, as the build quality and accuracy is so good that it will easily pay for itself over time. In all honesty, I can say I am a very happy Altendorf customer and can’t imagine using any other panel saw.